Welcome to the Journey Journal Online travel podcast about traveling, vacations and trips that you can take. My name is Lee Wiegman and I want to help you get the most out of your vacation. This episode I’m going to talk about how to book a beach house vacation, but first I want to talk a little about my direction, at least for now. As I record this it is January 2013 and for the New Year I have plans to add lots of content to this podcast and the blog. I also have some definite travel plans, and a few things that are in the works. I didn’t travel a whole lot in 2012. There were no international trips, and I wasn’t sent anywhere outside of my own state for my day job. Frankly it had me a little depressed, and I think that is what got me in gear to actually start this podcast in October. If I wasn’t traveling as much at least I could talk about it and get myself psyched for some future plans. The whole process has definitely got me thinking more about traveling and not just by adding onto that list of destinations where I want to go and see someday. I’ve been following more travel blogs and podcasts, and it seems that there are a couple big types of content creators out there. First is the “Extended World Traveler”. These are folks who have decided to live a different lifestyle not tied to any particular location. They might be backpackers, students taking a gap year that just kept going, or people on a career break. It’s definitely fun to fantasize about making a big life change and seeing all kinds of places with that style of travel, but in reality, I don’t think it works for my situation right now. Not that I’m ruling it out in the future, but right now I love my home, my house, and my wife who doesn’t share that same kind of dream. The second type of travel podcast and blog I see is the “Disney-centric” site. No kidding here, there are podcasts just dedicated to all things Disney. Don’t get me wrong, I like Disney. Becky and I honeymooned there and we return about every five years just to get some of that Disney magic. I feel that its a big world out there and I don’t think I could handle the squeaky clean, sanitized Disney experience more than once every few years. The third and fourth types I see are the deal site and the road warrior sites. This is all for those people who are crazy for the cheapest you name it, flight deals, hotel deals, cruise packages. The road warriors deserve respect. Anyone who travels for their job week in and week out pays their dues and I think deserves all the travel upgrades and perks they can get. Ratings for the best first class restaurants, hotels and airline perks are what these seem to be about. That’s not what I’m about. I am about experiencing travel on self-led vacations, meaning, I book my own trips, usually through the Internet. I want to go on a vacation and return home. Usually a week, but I’m looking forward to a two week break someday – that might change my perspective. I want to go to an area and explore, but sometimes I just want to drive a good long road trip spending a night or two at each stop just to keep moving. The world is a big place, and I think anyone can do this so I sharing. Hopefully I can pass along something you didn’t know before, or even just give you a taste that might get you excited enough to visit a place you haven’t been before. So how about the Outer Banks of North Carolina? On one of our beach house vacations, we took my in-laws along. They both said they were so glad we did this and pushed them to do it because they never would have known where to start in planning a trip like this and renting a house. they needed a little push and that is what we gave them. I don’t think it involves any special skill besides the patience to search the web, you just need to know where to start. Let me talk about the Outer Banks a little bit. The coast of North Carolina has a chain of barrier islands running down the length of its coast. 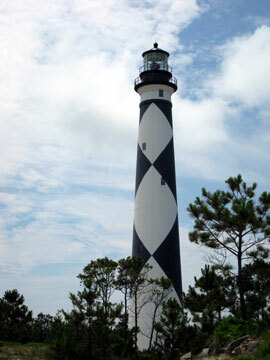 These islands are mostly sandy dunes and range from pretty highly developed to uninhabited nature preserves.There’s Kitty Hawk and Nags Head in the North; Hatteras and Rodanthe in the middle and Emerald Isle and Topsail Island in the Southern Outer Banks also known as the Crystal Coast. So where to start? Your decision might be based on where you live, and how far you want to drive, but I think there is a different character between the more northern and southern regions. I spent several years in a row visiting the Crystal Coast, specifically Emerald Isle, and I found it to be populated by mostly single homes or duplexes. Scattered around are a few condo units, but very few. It’s a very family oriented place, and there aren’t a lot of bars or night clubs on the island. Up North in Kill Devil Hills things can get a bit more lively at the bars and events like Bike Week. Once you decide your general area, start looking for realty companies that rent houses and condos in your target area. Seriously, I know you might not want to hear me say – “just do a Google search”, but in my experience the realty companies that handle the rentals tend to change and some of the houses will be handled by a different company from year to year. There are also worldwide vacation listing sites like HomeAway.com and Vacationhomerentals.com. Here you can find vacation homes to rent just about anywhere around the world. 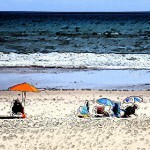 Check my affiliate link at www.journeyjournalonline.com/homerentals The other thing to consider is access. If you are from the eastern part of the United States and don’t mind a drive I think it makes sense to drive here, because renting a house for a week, we tend to bring a lot of stuff like beach chairs, umbrellas, kites, musical instruments. I know that sounds like overkill, but its how we like to do it. There are other options. Most all of the equipment you would want on a beach vacation is available for rental like beach chairs, and umbrellas, even bikes and boogie boards! This means that if you are from further away – like the middle of the US, you can fly into Raleigh and rent a car, and all of your stuff. That way you don’t have to store it all year long, either. So when you are doing your web search you can also get leads from friends on houses they have rented. I could probably find a dozen people at work or among friends who have taken a vacation to the outer banks in the past several years. Online booking makes the process pretty easy by showing you the availability and price breakdowns. There are a lot of factors that go into the house that may or may not be important to you. First off would be the number of people you plan to have come along. You want to get enough beds for everyone, and in fact, keeping more people than allowed for on the contract could get you kicked out of your house without a refund. Next is pets. Whether or not pets are allowed will be explicitly specified. Usually houses that allow pets have an extra charge and a limit on the number of pets. I have found also that the houses that do allow pets may not be quite as nice as those that do not, but I’m sure there are exceptions to this. If extra amenities are important to you you can search for those as well. things like Air conditioning, Wifi Internet access are very common, but Pools, Hot Tubs, and even game rooms and pool tables are available in some houses. One thing important to me is having a house with a covered deck, which not all of the houses will have. This will let you continue to enjoy the beach breezes when you’ve had enough sun for the day. Location in relation to the beach will have a big bearing on price, and also might be very important to you. Terms like oceanfront or ocean view,, 1st row or second row are important to me. Becky loves having an oceanfront house. This means, you walk out the back door, across the deck and you are on the beach. You don’t have to use a public access point, or walk down the street or even across the street to get on the sand. Price obviously goes up accordingly when you are right on the beach, but it really is amazing to just sit on the porch or even in the house and just stare out at nothing but sand and ocean. You might be able to get a bigger house with more amenities at a cheaper price one or two rows back, and you will still be able to get yourself out to soak up rays or fish in the surf. Plus if you have more people with a wide variety of interests, they may not all be beach loving sun worshipers. Because the islands are so narrow, there is also the option of the sound side. The sound is shallow body of water between the barrier island and the mainland. They are sometimes shaded with some trees and many times will have boat dock access. If you have a boat you could tow it down and dock it right at your house in some cases. The price for sounds side is also usually cheaper than than the beach side. The last thing to talk about with relation to the houses is insurance and deposits. Vacation insurance can be a whole discussion in itself, and when the rental contract mentions insurance that is most likely what they are selling you. This is in case something happens to you or there is a major weather event like a hurricane that prevents you from your stay in the house. Since I typically try not to go during hurricane season, and we go with multiple couples or families, we don’t get the insurance thinking that if someone had to back out they either eat their portion of the rental or find someone else to take their place. This insurance does not cover if something breaks in the house. That is the damage deposit and it is not optional. You should make it a point to check your house very carefully on the first day and notify the rental company or property management company noted on your contract if you find anything wrong. this could include, windows, doors, appliances, furniture, leaks, or anything else. We have found little things wrong in all the houses we have rented, and it is better to be safe and tell them about it just so you don’t get charged. In the very least, they are usually out the next day to repair or replace anything, and they are happy to get the notification. Before I move on to the rest of the logistics I wanted to stop and tell you what kinds of things you can expect to see and do here. Besides sitting on the beach soaking up the sun, walking and picking up shells, surf fishing, swimming, surfing, kite flying and skimboarding are all popular. There are nature preserves where wild ponies and birds of all kinds rule the island. Many of these can only be accessed by kayak, and kayaking in the surf and the sound are both fun. Seafood is plentiful in the fish markets or you can charter a boat to reel in the big one yourself. This can be pricey – even if split between a group, so fishing from piers may fit smaller budgets better. Aquariums, museums, and shopping are also a favorite pastime for taking a break from the beach. I always think its nice to “do nothing” but we always end up with a new experience and sometimes even nothing is something. If you are renting a house, here are some things you might want to bring, and several you absolutely should bring. Linens if your rental house does not provide them. this will be specified when searching or in the contract. This includes bed sheets and bathroom towels. Toilet paper – this not provided and there may not be any if the previous renter did not leave any. If you are arriving after a long drive, you might want to have this packed so it can be the first thing you bring in the house. We learned this lesson the hard way! Coffee filters – usually coffee makers are in the kitchen but you will need filters. Either bring them or buy them, but I bring them so I can have them the first morning in case I don’t go shopping the day I arrive. This is another thing we’ve learned the hard way! Cards and games and also books you have been meaning to read. Sunscreen – very important! Save your skin and apply it early and often. Anything in the kitchen that you know you can’t live without and don’t want to risk not being there. All the normal pots pans, spatulas, dishes, and silverware will be there but not all specialty items may be there. If you are driving and have the room to spare, beach chairs and beach umbrellas or shade tents, but these are things that can usually be rented on the island or nearby. The list of what not to bring includes food, unless you have a brand or specialty food you must have. There are supermarkets there and you can buy food a day at a time or enough for the whole week. If you have multiple families you might want to go in on this and split the bill. Or not – it depends on how you all get along with that kind of thing. Other paper products like napkins and paper towels can be bought after you get to the house and assess what previous renters have left–sometimes you have to buy dishwasher detergent or sponges to wash dishes with, but you usually get lucky and find that renters before you have left some. There are hardware stores and drug stores so you can buy just about anything you might find that you need once you get there. There are beach specialty stores on the Island – in fact, there are a lot of them. 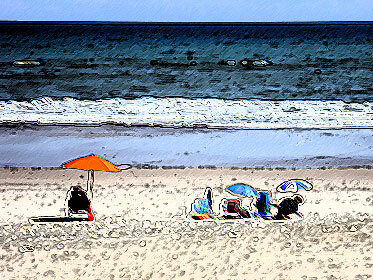 If you want something beach related, from bathing suits to boogie boards you can wait until you arrive and buy it there. Fishing tackle can also be purchased there because coastal fishing requires some special equipment that is different from inland freshwater fishing. A store near you may not carry this kind of tackle but the shops on the island certainly will. If you have extra food that is non perishable you can donate it at the end of your trip. The town where we stay has specific charities that are set up to take the food at the end of your stay. Nobody has to do any activity that they don’t want to do. The last thing I’ll mention is that most of this could be applied to any beach vacation, not just the outer banks, or almost any vacation home rental for that matter whether a ski trip or a European villa. Go relax and enjoy yourself. Thanks for listening to the podcast. I really want to focus on recording some great shows for you this year, and if you made it this far and you like it, could you do me a big favor? could you share it with a friend? Whatever your preferred method of sharing, email, Facebook, Twitter, Google Plus or homing pigeon, please share the podcast with your network to let people know I’m here and I want to share some stories. You can contact me through the blog at www.journeyjournalonline.com on Facebook.com/journeyjournalonline or email lee@journeyjournalonline.com I want to hear from you what you liked or didn’t like. Until next episode, enjoy your journey!